Until it stops. If I am still long enough, the emotions are stopped by that ever useful boiling-blood – brain barrier. The cyclone that tried to blast out through my arms and legs and mouth is contained in my head. why how what why why why where have i failed? Then my brain flings out frantic search beams into the cloud of memories, anecdotes, stories, books, advice, hearsay, logic, illogic; begging these diverse bits of information and theory to fall into some kind of semblance of direction. It doesn’t. They don’t. I still don’t know what to do, and am too tired to search. But the whole hot mess subsides and I start to breathe again. Nothing is resolved, but we have survived another crash. We have made it one step further. We recover. I gather my strength. I know that whirlwind of negative emotions is indeed my soul, the core of my being, because there is neverending love at the collective root. They started when he was ready to leave the safe space of my womb, and they stopped when he achieved it. Pain and doubt and anger and fear are then literally flooded out by love and pride. I can still feel the rush of that flood through my veins. I can do this. I have to do this. No one else can do this. Each contraction pushed him farther from my womb, into my arms, always in my heart. Where are these contractions pushing him? Me: So, Karel, I hear that you’re starting to sound like me lately. I mean, yelling at Emil to stop doing things. I’m going to try to stop shouting. Because here’s the thing: it never works. Karel: Yeah… EMIL STOP TAKING MY LEGOS!!!!! Karel: Mama, I was wondering if you could do something. Karel: Well, I was wondering if you could be a little more like me. Like maybe not being so angry at Emil and scaring him by saying you are going to leave him. Karel: Because he’s so small. Me: Yes. (And because he is a lightning fast fearless maniac). So sometimes I just have to walk away to show you (ahem) the right way to go. Karel: Oh Mama. I understand. My boys are highly distractable, highly independent, incredibly difficult to motivate unless it’s something they themselves want (read: practically unbribeable), and are deaf to all sounds in parental-voice decibel range. BUT it seems, friends, that if nothing else we at least have an empathetic listener on our hands . If only you could have heard the tone with that ”I understand, Mama. I really do.” Seven going on seventy. Please excuse me while I finish my scotch. p.s. The kitten is a real thing. Also a boy. I would write about it now except I need to eat some ice cream. I am so tired that even before typing those words — just thinking them — i had to get up and refill my coffee. The coffee pot that I almost filled up yesterday morning, before I remembered that I’d be the only one drinking it. These guys have been living with and helping me manage our day-to-day chaos for the past 2 weeks, and just left yesterday morning. They arrived the day after we got back from a taste of summer and a 60th birthday festival in the south with these guys, and this guy has been travelling for basically the past two weeks. And life goes on in the meantime. Swimming lessons, track practice, library books, school meetings. Finding lost papers, paying forgotten bills. Putting up the ladder for the chimney sweep who just had to come now. It’s all coming back to me — We flew to Kristiansand and drove to Arendal for Ivar’s 60th birthday celebration, which was to be a mega party of several days. I don’t think we’d flown anywhere since the previous fall, when Emil Birk hitch-hiked back from the zoo. So, please, imagine our surprise when ALL OF THE TRAVEL WENT INCREDIBLY SMOOTHLY. Not a single horror story to relate. And we ate and drank and celebrated 60 years of Ivar in the warmth of the southern coast. We drove home from the airport after Arendal, and then drove back the next day to pick up our American grandparents and Uncle. They fit right in to our routine like they live next door. Bjørn was gone for 8 of the days they were here, and I was extremely grateful for the back up. It’s not fair to travel all the way to Norway just to babysit, though, so we took one long weekend and drove our Wisconsinites, who had just survived a winter of polar vortexes, back into the snow through the mountains to Røros. One UNESCO World Heritage Site and one Eurovision Song Contest in one weekend? Pretty sure that checked ”Cultural Experiences” off the to-do list. It can’t be said enough how grateful the five of us are to have family that is willing to travel to come see us. A very belated thank you for a very lovely visit. June: June, june, what happened in June? YES — the first showing of our house. Can I just say how weird it is to have your house be so clean and empty that it echoes? Part of me was proud, and part of me rolled my eyes. I’d spent seriously years trying to banish the echoiness of that house. Anyway, we took Karel to track practice, ate pizza in the park afterwards, and kept waiting to hear from the realtor. No one came, friends. No one came to witness the beauty and echoiness of Solvangvegen 17. Anyway, that’s all I really remeber about June. Wait! My little brother asked his beautiful girlfriend to marry him in June! Hearing the words ”and I asked her to marry me” come out of his mouth caused my heart and gut to react in exactly the same way they did watching our last baby take his first steps. Thank you, thank you, thank you to Jessie for saying ”yes” to Jon and all of us. Summer 2014: It was hot. We develop a routine — one day at the beach, one day at home. We counted that we visited seven (or was it eight) different beaches, most more than once. Cai Ruben learned to walk at the beach — on the sand, on the rocks, in the water. He discovered splashing and sitting and throwing rocks in the water. He used the inflatable swimming ring as walker and cruised along the waterline. We really did spend July in the water. As in, I actually went into the water. We hoped we’d be moving in July, so we didn’t make any travel plans. And we couldn’t have found better summer weather anywhere else. The boys were naked all. the time. I’d get them dressed, send them out to play, look out the window and their pants would be gone. But can you believe there are so many beaches around here? Long sandy, shallow beaches where you can wade fifty meters out and have water still be below your knees. PERFECT for children of a slightly water-phobic mom. AND we had guests! My highschool classmate Katie and her husband Tim just happened to be in Sweden, and decided that it wasn’t too far out of the way to come and see us! It was a real blessing to reconnect after so many years. Katie and Tim’s visit had a lasting effect — Emil Birk, who until that point had refused to speak English to anyone (despite his perfect comprehension), suddenly just started explaining things to our guests. In English. We were quietly elated. Oh! AND after three more showings, our house sold! Cue simultaneous feelings of freedom and slight anxiety. Now we can move! But where?? August: Right, so, since we needed to find someplace to move TO, the primary activity of August was househunting, and getting ready for Karel to start school at the end of the month. By the grace of God, both objectives were met with more success than we had hoped for. We found a house that we thought was out of our league — twice as big, good condition, stunning view, walking distance from school, apples trees in the back yard! — and put in our best offer. Turns out it was the only offer, which meant our best was good enough. Even now, 6 months later, we’re still in a little big of shock. Our bid was accepted the week before school started, and transferring Karel’s information from one school district to the new one could not have been easier. So then there was that — our first born starting first grade. He was excited, and nervous, and brave and started in his new school without a second glance back. But just how he got big enough to start school I still do not understand. Upping the tempo a bit here now, because this is NOT going to go to a part 3. September: Bank meetings, paper signing, walkthroughs, PACKING PACKING PACKING, calling on friends shamelessly to move heavy objects from one side of town to the other on repeated days. Moving in the middle of the week for reasons that we questioned in the midst of the process. We started to paint and plaster at the new place with the dream of finishing before we moved in. Bjørn travelled to Italy, I got sick, Bjørn travelled somewhere else, I became a bit of mess… but one way or another we got all of our stuff in and were waking up to the view of the fjord by the end of the month. September brought some bumps in the road for Karel during school, as we set down that path of learning some of life’s hard lessons. September also brought us a 4 year old, and saw a one year old who could barely walk start to hop. With both feet. Off the ground. October: As of October 1st, we turned over the keys (and consequently the mortgage) of Sølvangvegen 17. Super great to be back down to having only one house to clean. We spent October getting organized, I think. Or at least settled. We made applesauce and apple pie from apples from our very own apple trees. We discovered that there is a small woods adjacent to our lot, so while we no longer run through the woods to get to barnehage, we can at least play in one when we’re home. November: I think November was pretty calm, too. We worked on getting into our new routines with school. Bjørn was travelling a bit more again, and things were a bit tense at times with trying to help a first grader with way too much homework while willing the two smaller ones to not harm each other. But we made it. I started looking into what it would take to be a doula in Norway, and had a lovely and informative meeting with one of the two doulas in our section of Norway. We celebrated Thanksgiving with the local North American crew, which had everything it should have: turkey, stuffing, potatoes, pies, wine, friends, family, running kids, and as if that wasn’t enough, for one reason or another we all started singing from ”The Sound of Music” … and the day was perfect. December: December brought us to our first Christmas in our own house, and all that came with it. Gingerbread, decorating, meal planning. Bjørn had arranged for Ann Inger to take ALL THREE BOYS for a night in the beginning of December (honestly, I had nothing to do with it) so we were able to start out the holiday season with clear heads and child-free shopping. This year felt much more relaxed than other years, and I wonder if that early night out had something to do with it. On that little trip I also bought a new dress. It is wool. A wool dress. And it is the most comfortable and warmest thing I have ever had on ever so I think — I think — I have jumped up another step on the assimilation ladder. December isn’t december without a little bit of drama — ours came in the form of urgent care visits for a cat bite (Cai Ruben); a sudden overwhelming sulfer-y smell in the house on the afternoon of Christmas Eve (I was desperately forming evacuation plans in my head); and a little conversion mix-up which led me to accidentally buy a 20 pound turkey (instead of say, 8) to feed 5 adults and 3 children on Christmas Day. Needless to say, everything ended up juuuuust fine. So there we have it. Seven — no, eight months recounting the random blessedness of our little lives. The Lord continues to shine His face upon us… and keep us warm. That my oldest son has calmed my anxious mothering spirit. We were sitting at the table talking together after Bjørn had come back from a business trip of several days. It had been a rather loud and fractious several days for those of us at home. So I said as much — ”This time when Pappa was gone wasn’t so greit (okay)” Karel: ”Really? I thought it was greit.” (eyebrows raised) Kim: ”Well, Mama was pretty crabby.” Which was true. And maybe an understatment. Karel, dismissively: ”Yeah, but moms are just like that sometimes.” A simple statement, but it felt like absolution. That Cai joins in the morning franticness of getting out the door by diving in and pulling out his boots from the massive pile of footwear in the entryway to try to get himself ready, but then reaches both arms up with an urgent ”Uh! Uh!” for goodbye hugs to the departing when I tell him he’s not going with today. That Emil and Karel MUST hug before Karel goes to school even if they’d been antagonizing each other seconds before. That Emil plans what he’s going to make with Perler beads at barnehage the night before. It’s his new obsession. I love it and am very happy to keep it a barnehage-only activity. Did you see this picture on facebook? That kid with the hair in his eyes? That’s Karel. Karel has refused a haircut for the past month, but sometime this weekend there’s gonna be some trimming going on. I can’t take it anymore. Even the hair wax he used to make his hair ”look nice” for church on Easter Sunday didn’t hold it back. His hair also covers his ears, which we have established does not, in fact, impede his hearing. When we had the standard 5 year-old well-child check, the nurse talked a bit about how this stage of development is kind of a mini-adolescence. Eye-rolling? Check. Blaming of parents for everything/anything not right in the world? Check. Experimentation with power (”I’m bigger, faster, and stronger than you, Emil Birk.”)? Check. And the gun play I managed to avoid for so long has now entered into our home…and trickled down to brother #2. I know it’s normal, I know it’s okay, I know I’m too defensive about it, but I’m not ready for my baby to start knowing that sometimes people hurt each other on purpose, not ready to hand him the fruit from the Tree of the Knowledge of Good and Evil. 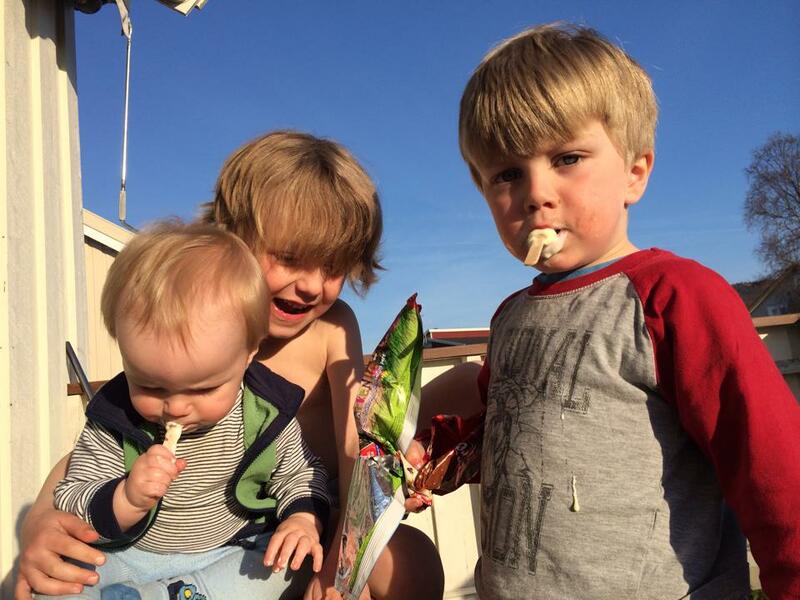 However –note to self — it turns out that our children are actually individuals in and of themselves, who don’t really care so much when I’M ready for something. 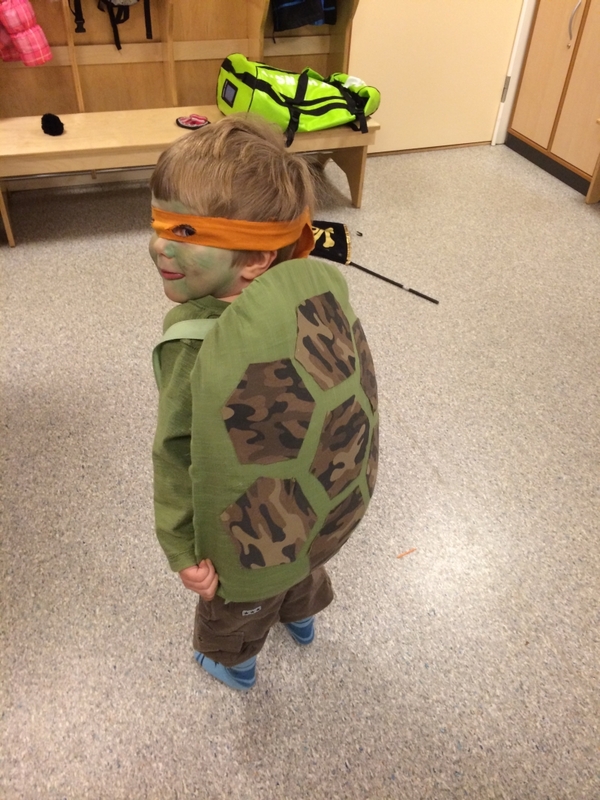 Anyway, Karel finished the first round of swimming lessons and is now starting track and field and his indefatiguable energy is often mentioned when they go ”på tur”/looooooong walks at barnehage. And just like every other big boy, the bravado comes off at bedtime and I get to go back to snuggling him like a toddler. Emilian Birk, on the other hand, loves a snuggle at bedtime but can’t stand the heat. ”Æ e så VARMT!” / ”I am so WARM!” Last week when it was still cold at night he was in bed, shirtless, and asked me to ‘‘kaldt mæ opp” — to ”cool me up”, which is evidently the opposite of ”warm me up”, with my cold hands. Emil is the child who runs outside shoeless into the snow. The child who refused to wear socks inside his boots — who actually took off his boots, then his socks, then put the boots back on again — and still has warm feet. He’s coming into that awesome (read: extremely time-consuming minefield laden) age where he has an opinion about what clothes he wears. This morning he needed a shirt that didn’t have anything on it. Nothing. Fortunately I found one, able to finally fulfill a request that thankfully wasn’t physically impossible. Unlike yesterday, when he wanted to stop and have a picnic with a drink of water in the middle of our walk. Found a lovely little picnic spot and sat right down. I didn’t have any water. I was also unable to magically conjure some up on the spot. 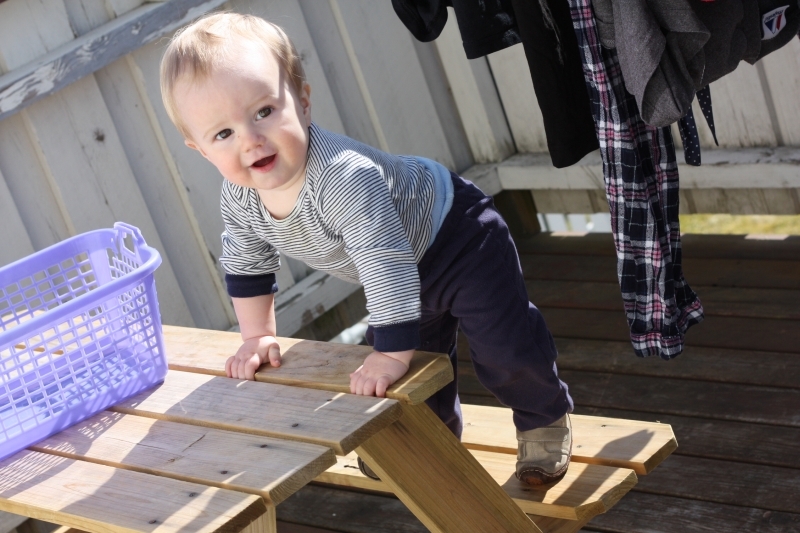 This inability to conquer the rules of physics, time, and space is a huge flaw in my ability as a mother, and Honest Toddler blog posts reel through my mind every time I fail. Thank you, Bunmi Laditan, for keeping my head from exploding. ANYWAY, Emil Birk has started swimming lessons now, he’s started talking again at barnehage, and is in seventh heaven now that it’s spring and the bugs are out. We spent a long time checking out the ecosystem of bark and ants and spiders and moss on a neigborhood tree yesterday (after I managed to distract him from the picnic crisis). He sees the tiniest insects, and rejoices over every single fly that buzzes against the window. And then there’s Cai Ruben. 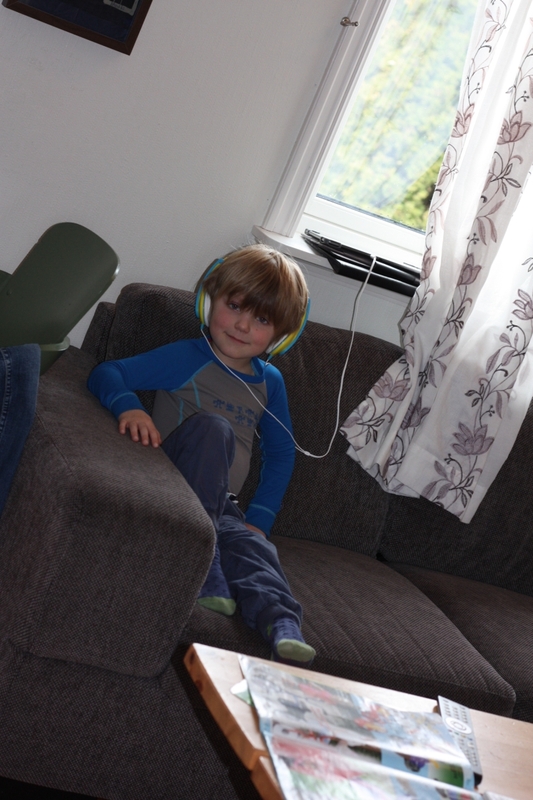 Whereas Emil Birk thinks he’s a grown up, Cai thinks he’s a big boy. In the last few days he’s learned out to get down from things — the bed, the stairs, the couch, and overturned box — and practices at every opportunity. On our walk yesterday we stopped at a little park nearby and he got to swing for the first time. Little adrenaline junkie that he is, he totally loved it. He also tried to practice his ‘getting down’ skills on the steep enbankment at the edge of the park. I feel like I’m pretty relaxed as a mom. I mean, the constant risk-analysis calculator is constantly whizzing in my brain, but more often than not the risk isn’t so great and I let them get on with whatever they are doing. * With some exceptions, of course. Emil Birk, despite his constant asking, is not allowed to climb onto the roof. So really, really? is it asking too much for the one year old to stay away from the embankment and the 3 year old to keep his shoes on? ‘Yes’ is the obvious answer to that question. ANYWAY, Cai’s latest cute, non-dangerous trick is playing peek-a-boo with his hands. He covers and ear with one hand and squishes a cheek with the other and says ”BUH! !” It is quite possibly the cutest thing I have ever seen in my entire life, and he will not do in front of anyone else. So I just keep describing it to people, which is much less cute and probably much more annoying. In other news, we’re working on selling our house. Moving within the same town feels kind of anticlimatic, but we figure normal people do it all the time, so we can too. In which we discuss the challenges of Karneval. As one who doesn’t work outside my home (or really inside my home either, judging by its current state), the energy, ingenuity, and creative thinking that would normally be concentrated on a very important, world-saving, economically reimbursed real-world problem is instead diverted to situations slightly less far reaching. I used a fair amount of mental energy on these, people. Enough mental energy that I started to feel a tiny little bit silly. Silly enough that I started to come up with justifications (ahem, see above). To what end, you ask? What was the success rate of the energies, mental and otherwise? One ‘oh-wange ninja tuw-tul’ (that’d be Michaelangelo, for all you non- 80s babies), who was excited and happy and proud about his mask and shell and green face paint for the first two minutes of barnehage until he realized I was leaving him with all these other people in costumes. Turns out when you’re 3, costumes on other people can kind of freak you out. And one tiger, crying. Please note that I did not make the tiger costume. I made a shark costume. What is slightly more crazy is that I made a shark costume with the full realization it probably would not be worn. I made it for the challenge. And for future costume wearers in the family. So there. Anyway, Karel chose the tiger, after days/WEEKS of indecisiveness that manifests itself in full body gesticulating (that, come to think of it, looks a lot like a shark out of water) and ”instruction” drawing. Days and weeks of coming up with his own ideas that were brilliant…but out of my scope. A turtle shell one could crawl inside, for example, complete with a blanket and small t.v. to make it cozy. A crocodile that has is constrolled by levers and buttons you push from the inside. There is no room for artistic interpretation. When in costume, he takes on the role of the chosen animal and the costume MUST REFLECT THAT REALNESS. The lack of orange face paint almost triggered another melt down, but blending white and red and yellow was thankfully acceptable. Everyone in the car, all costume pieces accounted for, no more tears…and a very tentative sigh of relief from the two of us in the front seats. On another note, and for the record, the tiredness level after weeks of varying health in the grown-ups of the family has reached a new level. Emil peed in our bed during the night, and despite feeling the warm wetness on my pajama leg (he’s started sleeping in the center of the bed, with his head at my knee level), I slept on. I felt it, woke up, and consciously decided to sleep. in the puddle. of pee. There must be some kind of recognition for graduating (sinking?) to this level in the game of parenting. Anyway, here’s the Ninja Turtle. The Discontented Tiger was not available for photographs. Also: MANDY IS COMING TOMORROW!!!! NORWAY, ARE YOU READY??!!??!!? ?